Lucy and I do enjoy a midweek treat, certainly after a long day in the office. We both have lots of vegetarian friends and have heard wonderful things about the Prince George. Situated in the North Laine this is a short walk away from my office, and great for anyone hitting the lanes for a bit of Christmas shopping. We enter the pub and I have that feeling that I am in a real traditional pub, lovely wooden tables and a brick bar, complemented by a fantastic selection of drinks surrounding the mirror on the wall. From their fabulous wine list to their extensive real Sussex ales, I believe there is a drink here for everyone. But, Lucy and I are not just at The George to unwind with a drink after work, we are here to enjoy their vegetarian cuisine which I have yet to try. Priorities first, Lucy orders a French White Wine, the La Font Francais Picpoul off the menu and I have chosen one of the local Ales. The Ale is nice and hoppy, just the way it should be and the wine was very fresh and tasty; I prefer a white wine in the summer, but the selection is wonderful and Lucy is very happy. We sit around the corner so we have a great view of the buzzing activity in the kitchen, the tables are filling up and this is a popular pub, their reputation is clearly lived up to. Looking at the menu they have an extensive selection, from main meals to small bites, even a Mexican selection for those that like a little spice. Lucy is trying to eat more vegetarian cuisine and as I am devout meat eater this can make it hard, so this is my treat to her. However I am pleasantly surprised, the menu looks amazing and I quickly order the Falafel Burger served with an onion jam, harissa and coriander pesto, with Hummus and the most amazing chips. Lucy chooses the Ginger beer battered Halloumi served mushy peas, tartar sauce and chips; what a great alternative to a sea side town’s fish and chips. The burger is huge and looks amazing; the onion jam is a taste sensation and complements the coriander perfectly. There is wonderful crust to the burger and it holds up well without falling apart on the plate, a real skill to achieve for a burger of such great elements. Normal veggie burgers, in my experience, can run the risk of tasting bland and uninspired, this on the other hand is amazing and much better than lots of meat burgers I have had in Brighton. I may just be a convert yet! The chips are cooked perfectly, golden on the outside and light and fluffy in the middle. Lucy has the ginger beer battered hallumi placed in front of her and I am extremely jealous. This just looks like the perfect cod and chips with a side of mushy peas. The halloumi is battered with real care and looks as if it is a piece of fish; the taste is wonderful and the cheese gives an almost meaty texture. The hint of mint through the peas is a real winner and the tartar sauce compliments the meal in the same way as it does with fish. It is very tasty and I recommend this highly; the attention to detail is brilliant as sometimes I find battered fish can be dry and bland. This alternative to me is truly scrumptious and I would order this time and time again, if you only visit the Prince George once make this your choice. In such a popular pub we make the mistake of ordering our desserts at the same time as they are brought out when we haven’t finished the mains, in a place where you need to get there early it is best to order each course separately as the kitchen staff are flat out. A lesson learnt on this occasion. For the dessert I order the Affogato which is a delightful vanilla ice cream served with espresso coffee and Amaretti biscuit. It tastes lovely and would have been even nicer if I had ordered this after the main as the biscuit would still have held its texture and added another dimension to what was a very delightful flavour. Lucy will always order the sticky toffee pudding if it is on the menu and she is not disappointed, the slab of pudding is huge and drizzled in a salted caramel sauce, the vanilla ice cream helps cuts through the richness of the dessert. If you have sweet tooth this is the dessert for you. 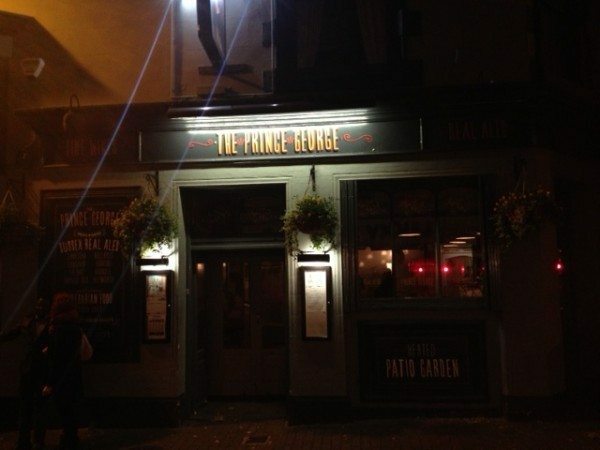 The Prince George is a great looking pub with a great selection of drinks, so is well worth a visit just to whet your whistle. If delicious vegetarian cuisine is what you are after then this is the pub for you. Be warned there is a reason this pub is so popular, make sure to get there early to grab a table as they do fill up quickly. The George is regarded as a well known Brighton institution, particularly for vegetarian cuisine. A great selection of dishes with care taken by the kitchen staff, this is a must visit pub.